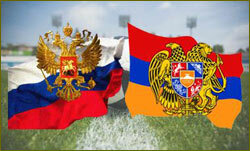 Tickets for EURO 2012 Russia vs. Armenia qualifier due in St. Petersburg are already available in Armenia, as well as Moscow and St. Petersburg. Ticket prices vary from 800 to 2300 rubles, passport required. In Yerevan and Moscow, tickets can be purchased at Visa Concord company sale points; in St. Petersburg, tickets are available in Armenian church-adjacent stores, Armenian Football Federation press service reported.